Oct 12-14, 2012 | Logan Launch Festival. 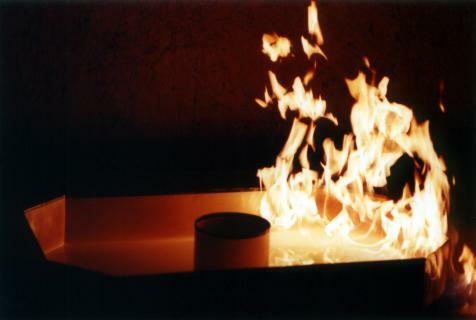 Nov 5, 2012, 6pm, Performance Penthouse | Ricardo Basbaum artist’s talk, sponsored by the Open Practice Committee. Nov 7-8, 2012, Exact times TBD at the short intro Nov 5, 5pm | Collective Conversation – a workshop with Ricardo Basbaum. 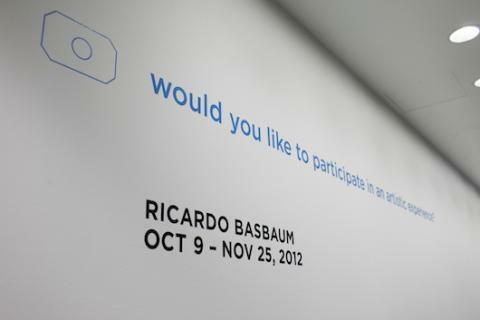 Logan Center Exhibitions is delighted to host the first solo presentation of Ricardo Basbaum’s signature project, “Would you like to participate in an artistic experience?” in conjunction with the Logan Launch Festival and continuing through 25 November 2012. 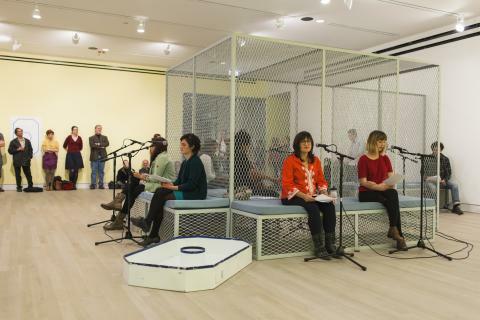 Once it is in their hands, participants (be they individuals, groups, or institutions) define what to do with the NBP object, where it will be taken, and how their artistic experience is documented. 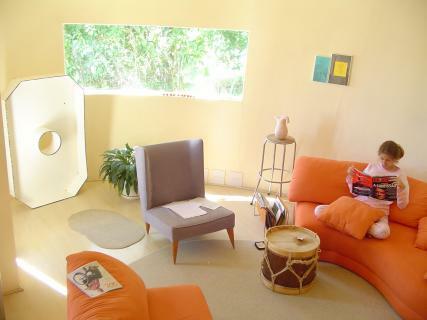 The results are radically open – “the fruit of your own desire and effort.” Traces of this process are then uploaded to a website, which has been documenting the evolution of the project since its inception in 1994 (http://www.nbp.pro.br). Basbaum’s work offers a base—at once concrete and dynamic—for imagining the workings of our networks. On the occasion of the exhibition, the Logan Center Gallery space becomes a physical interface with the project. On display will be an array of videos showing past use of the NBP object as well as a set of diagrams that have evolved with its circulation during the past 18 years, across 40 cities on 4 continents. 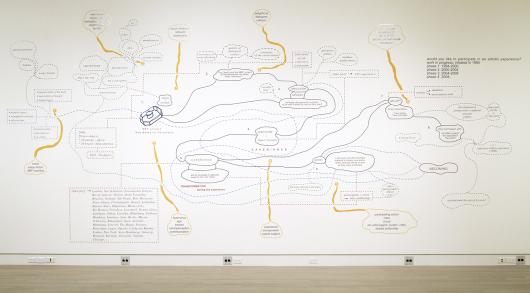 These vast mind maps, at times resembling psychedelic paintings, offer insights into the artist’s changing thought-process, which is marked by acute attention to infiltration and contamination from outside forces. One of the diagrams remains open-ended, with parts of the wall left to accommodate documentation of the NBP object’s use throughout Chicago. Also present is a metal structure, which carves out a space within the space of the gallery, almost like the circle inside the NBP object and sign. 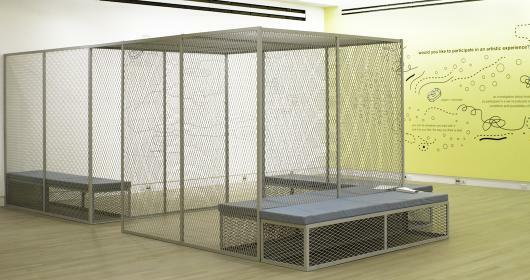 Part sculpture, part enclosure, part resting space, Basbaum’s metal structure facilitates the contemplation of the diagrams but remains full of potential for other uses. Turning a fundamental question into an artwork, Ricardo Basbaum has devised a project “about involving the other as participant in a set of protocols indicative of the effects, conditions, and possibilities of contemporary art.” In hosting the project, Logan Center Exhibitions invites the public to take up the great challenges associated with confronting one’s own desire, defining the terms of participation and considering what it means to experience art today. Curated by Monika Szewczyk, Visual Arts Program Curator, Reva and David Logan Center for the Arts. 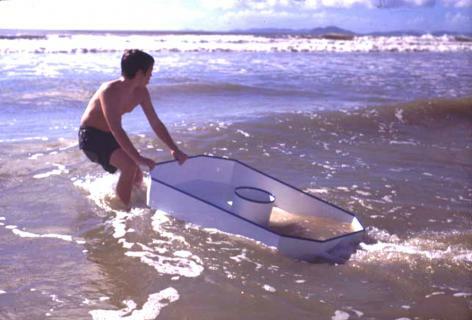 Ricardo Basbaum (b. São Paulo, Brazil, 1961) is an artist and writer based in Rio de Janeiro, Brazil. Recent exhibitions include 30th São Paulo Biennial A iminência das poéticas (The Imminence of Poetics), 2012; Busan Biennial 2012, Garden of Learning; A Rua: Rio de Janeiro and the Spirit of the Street (Museum of Contemporaray Art in Antwerp, MuHKA, 2011); and the 7th Shanghai Biennial, Trans Local Motion, 2008. 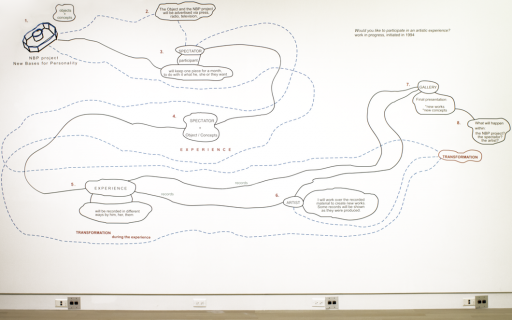 In 2007, “Would you like to participate in an artistic experience?” was featured in documenta 12 – an occasion that precipitated the manufacture and circulation of 20 NBP objects and the construction of his website devoted to the project. 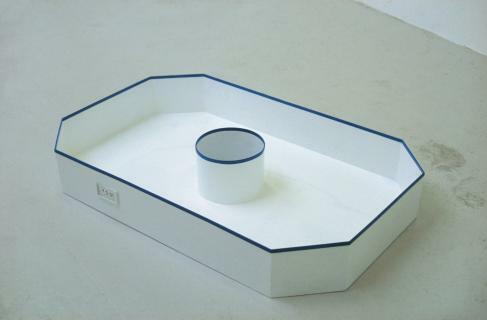 In 2006 he co-curated On Difference #2 (Kunstverein Stuttgart) and pogovarjanja/conversations/conversas (with Bojana Piskur, ⇧kuc Gallery, Ljubljana). He is also the author of Além da pureza visual [Beyond Visual Purity] (Zouk, 2007) and a contributor to Art after Conceptual Art (ed. Alexander Alberro and Sabeth Buchmann, Generali Foundation, MIT Press, 2006). His collection of essays Manual do Artista-etc [The Artist’s Manual-etc.] is forthcoming from Azougue, 2012. Basbaum completed a PhD in Arts at the University of São Paulo in 2008, and currently teaches at the Instituto de Artes, Universidade do Estado do Rio de Janeiro. In the Fall of 2013, Ricardo Basbaum will be the Tinker Visiting Professor, Center for Latin American Studies, University of Chicago. 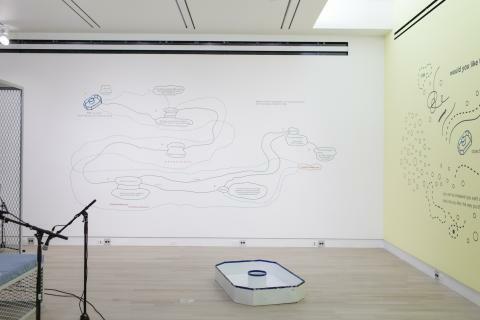 NBP is broad umbrella term for complex investigations of subjectivity involving drawings, diagrams, objects, installations, texts and manifestos, initiated by Ricardo Basbaum in the 1990s. This historical moment coincided with the aftermath of the military dictatorship in Basbaum’s native Brazil (March 31, 1964 to March 15, 1985), the great transformation of the world order following the fall of the Berlin Wall in 1989, and the rise of a globally networked reality. 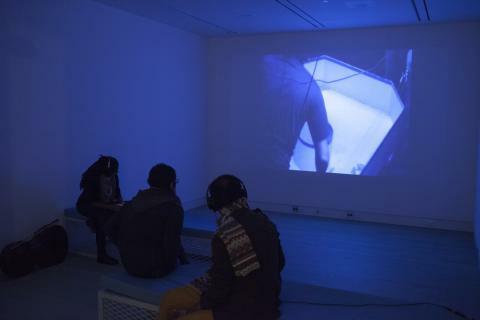 As the physical version of the NBP, the object at the center of “Would you like to participate in an artistic experience?” presents a curious antidote to the professed dematerialization of art (and of life in general) in the digital age. With its enigmatic geometry and substantial weight and scale, it offers itself up for myriad interpretations, but all of these involve the body.